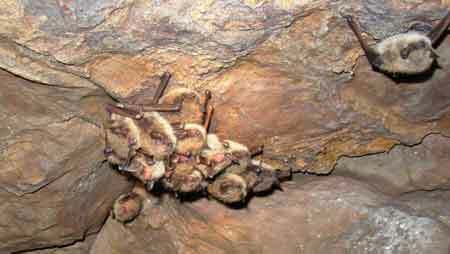 Cluster of Indiana bats in a cave. Photo by Roger Perry. U.S. Forest Service Southern Research Station (SRS) researchers and collaborators just received news that the U.S. Fish and Wildlife Service (USFWS) funded two of their proposals on white-nose syndrome (WNS), a disease that affects hibernating bats. One grant funds research on bat survival, while the other helps set up a program to monitor bats nationwide. SRS research ecologist Susan Loeb, SRS research wildlife ecologist Roger Perry, and Forest Service Northern Research Station’s research wildlife biologist Sybill Amelon, received a grant to investigate survival rates and dispersal of cave-dwelling bats in the southern and midwestern U.S. In the northeastern U.S. where WNS first occurred, at least 5.5 million bats have died since 2006. However, mortality rates appear to vary among bat species, and in some hibernacula (caves where bats hibernate for the winter), numbers of bats have reached stable levels and may even be increasing a little in some sites. With the grant, researchers will start a banding project in southern parts of the WNS-affected area—North Carolina, South Carolina, Georgia, Arkansas, and Missouri—to provide data that will help them better understand the dynamics of WNS-affected bats and compare survival rates in these areas with those in the northeastern U.S., where a similar banding project is already underway. USFWS awarded a second larger grant to Loeb and a wide range of collaborators to implement the North American Bat Monitoring Program (NABat) and set up a summer pilot study of the system. Loeb is a part of a team of scientists, along with researchers from the U.S. Geological Survey, the National Park Service and the Idaho Department of Fish and Game. Despite the threats to bat populations from WNS, climate change, energy development, and habitat loss, there are currently no coordinated efforts to monitor and track bat populations in North America. NABat is a multi-agency, multi-national collaborative effort that provides the architecture for continental bat monitoring including a sampling frame, protocols for acoustic surveys and colony counts, data management, and statistical analyses. Over the last few years, the Conservation and Recovery Working Group of the White-Nose Syndrome National Plan convened three working groups to develop the sampling framework and protocols for NABat which will be published as a Forest Service General Technical Report later this summer.